The skin is the body’s largest organ, there is about 20 square feet covering the entire average size body. It has unique characteristics determined by its location. For instance, the head contains more hair follicles, while the palms of the hands contain none. The palms of the hands and the soles of the feet are thicker. As a sensory organ, it is designed to regulate body temperature, stores water and fat. As a protective shield, it also prevents water loss and entry of bacteria, viruses and other external factors; guarding against heat, light, injury and infection. This layer is comprised of mature keratinocytes which contain fibrous proteins called keratins. The outermost layer will continuously exfoliate or shed on average every 28 to 30 days. The function of this layer is to prevent the entry of foreign substances as well as retain the body’s fluids. Located just beneath the stratum corneum, it contains living keratinocytes (squamous cells), which develop and form the stratum corneum. Basal layer: The basal layer is the deepest layer of the epidermal layer, and contains basal cells. These basal cells continually divide, creating new keratinocytes, replacing the mature ones that are exfoliated from the surface of the skin. The epidermis also contains melanocytes, which are cells that produce melanin. Melanin is what produces the color of your eyes, hair and skin. The dermis is the second layer of the skin and is comprised of blood vessels, lymph vessels, hair follicles, sebaceous glands, sweat glands, bundles of collagen, fibroblasts and nerves. Held together by collagen, this layer gives the skin elasticity and suppleness. It also has sensory receptors for pain and touch. 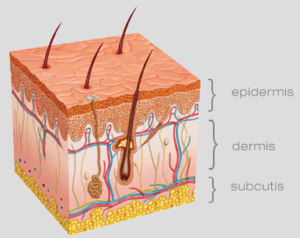 Subcutaneous layer The subcutis is the deepest layer of the skin and contains a mesh of collagen and fat cells, which act as absorbers and regulates body heat.